I have to admit that I may be (a lot) biased: I have always hated the dermatomes map. As an undergraduate physiotherapy student, we were just told to memorise them. No questions asked (mind you, I am talking about a decade ago!). I didn’t even know there were, not only a few versions of these maps, but also with contradictory information! I remember they were like a sacred painting. We were just supposed to admire the dermatome maps (in all 3 views), learned them off by heart and ask not questions. “This is basic Physiotherapy”, I was told. They became my memory nightmare. I remember trying ridiculous memory techniques to memorise them. They made no sense, they had no logic to me. Somehow, I managed to pass my exams… and promised to myself that these “very important” body maps would be pinned in front of me as soon as I got a job…I was made felt that without this knowledge, the hopes for a successful Physiotherapy assessment and treatment, would be close to zero. So I did. Started my career and those body maps followed me everywhere and, still, I couldn’t use them as most of my patients would not have a fitting pain pattern. And instead of questioning the body maps, I questioned myself and my abilities. Clearly, those maps had been around for years and everybody used them. Years passed and I developed a hate-fear relationship with radicular-type pain, which I blame on “my inability” to use and remember the body maps. Even during my Masters, I was ridiculed during one of the clinical placements, because I didn’t know the maps off by heart (after that, I considered open a juice-bar). This particular tutor had a brilliant CV, having studied (and received top marks) with some of the best physiotherapists in the world in Australia. I totally admired her and I wanted her to be my role model and professional inspiration… So this felt like a kick in the groin! (metaphorically speaking, of course). Thankfully, more years have passed and I have become (definitely) older, (a lot more) critical and (a tiny, tiny bit) wiser. I broke-away from the maps and I felt finally free! I moved on, forgot about them and I continued my career treating all kinds of pain without the maps. Me, myself and my clinical reasoning skills. “Physio life” was peaceful. Recently, I have lost my “sanity” and I moved into research, where I’m (funnily enough) developing body maps from spinally referred pain. Bet you weren’t expecting that, eh? (Me neither!) My research explores digital pain drawings from radicular-type pain from real patients!! Cool, right? In my literature search, I came across an article that brought me back to my “toxic-relationship” and my (nearly) juice-bar. This article confirmed my suspicions: the dermatome map is not as valuable as they sold it to me, back as an undergraduate (yessss, I knew it!). 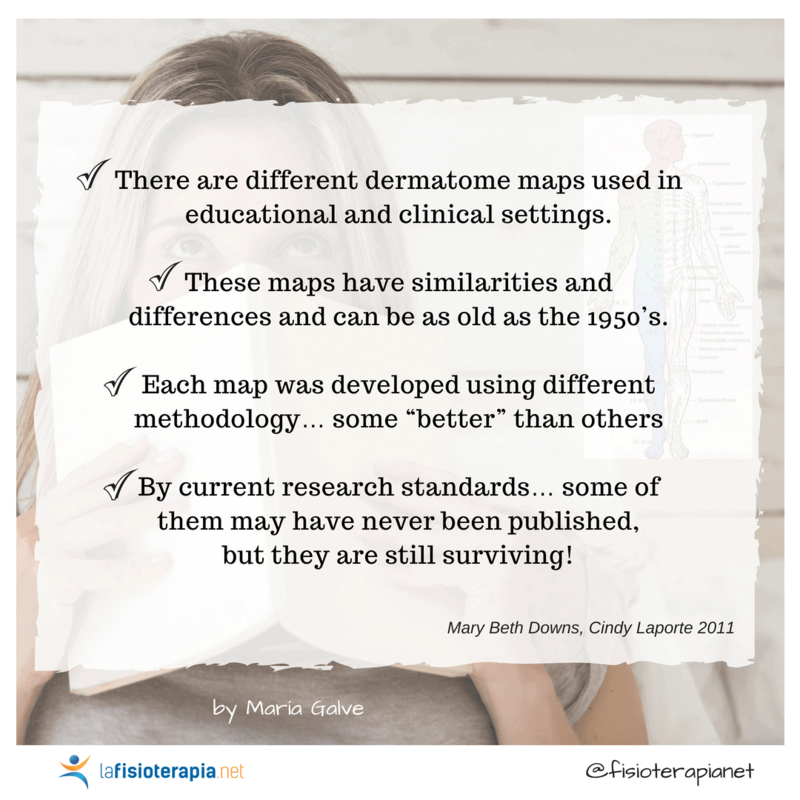 Downs and Laporte (2011) published an article about the conflicting information from the dermatome maps and their use in clinical and educational settings. It is so worth a read! You can access this article for free here. There are different maps used in educational and clinical settings. These maps have similarities and differences and can be as old as the 1950’s. By current research standards… some of them may have never been published, but they are still surviving! After reading the article I remembered the physio tutor that was close to make me leave physio to open a juice-bar. This goes for you: “Miss Right, f… off”. In conclusion, more and better research is needed to come our way and fulfil “the gap” left by the dermatome maps (may want to wait till I’m done ;)) when the use of new technologies may assist to create more clinically relevant maps. However, it also stirs the base of a lot of “basic knowledge” that Physiotherapy stands on. Guys, we really need to be more critical and not just take that something is true or valid, because it’s been around for years or “it works for me” (“getting rid of” the all the Miss Rights of the world would be helpful also). PS: Miss Right: I forgive you. Maria Galve is a Physiotherapist, MSc in Neuromusculoskeletal Physiotherapy and currently completing her PhD at the Center for Neuroplasticity and Pain (CNAP), SMI®, Dept. of Health Science and Technology, Faculty of Medicine, Aalborg University (Denmark). Her research investigates the use of digital mapping technology, and explores novel pain metrics to track, qualify and quantify changes of pain over time. 10 Facts about Pelvic Health: Strengths you didn’t know you had! This website is not intended to replace the always recommended medical assessment/treatment. If you present with an injury, a healthcare professional consultation is advised.